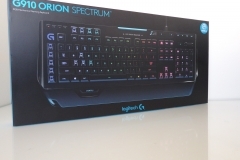 Home Hardware Reviews Keyboards Logitech G910 Orion Spark/Spectrum – What gives? We reviewed and loved the Logitech G910 Orion Spark – it was Logitech’s flagship RGB mechanical gaming keyboard and considered by many to be the pinnacle of gaming keyboards… So why did Logitech muddy the waters with a new version so soon, what’s changed and why? 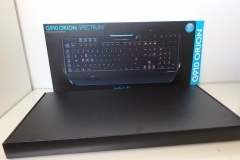 The Logitech G910 Orion “Spectrum” hit the shelves at the same price as the G910 Orion “Spark” – you could be forgiven for being confused as they look almost identical and share the same meaningful features. There are two key differences driven by consumer feedback – and it should be noted that Logitech is a company that does listen to gamers. I’ve had a number of enlightening conversations with Logitech representatives over the past few years where they explained the lengths that they go to with their eSports sponsored teams, forums, reviewer feedback and available statistics to see what gamers are looking for, what’s important to them and what’s considered a gimmick. As I understand it, the G910 Orion Spark was generally well received – I should note that I gave it an ‘Editor’s Choice’ Award. 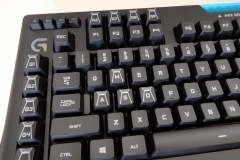 The shaped key-caps were designed to reduce mis-hits, thus improving accuracy. I felt, and still maintain that I’m most accurate on the Spark and am utterly convinced that it is due to the shape of the key caps. This accuracy, though, is more pronounced when typing reviews, emails and doing other non-gaming activities. We have taken the G910 Orion Spark to gaming events such as the 400+ gamer RESPAWN LAN in Melbourne where the feedback was, to my surprise, mixed. Some gamers liked the keys, others dismissed them after a few minutes and one guy decided that it grew on him after 10 minutes of Star Wars Battlefront. 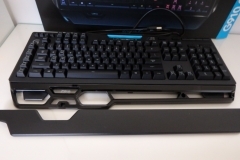 The other thing that consumers didn’t appreciate was the palm rest – or should I say, the pair of palm rests that could be interchanged on the original G910 Orion Spark. There was a larger palm rest that I use and a smaller one. The shape was a little odd but both had support in all the right places. The feedback from the masses appears to be in favour of a more plain looking palm rest that provides more consistent support along the whole length of the keyboard. It would seem that an important enough element of the target community had other views and felt that these two areas required simple enough tweaks and kudos to Logitech for their prompt response. Neither of these changes would appear to my (naive?) mind to be earth shattering. 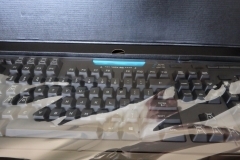 The palm rests on the original unit were interchangeable anyway and the fitted key caps from the G810 were more traditional than the G910 Orion Spark. How hard could it be? 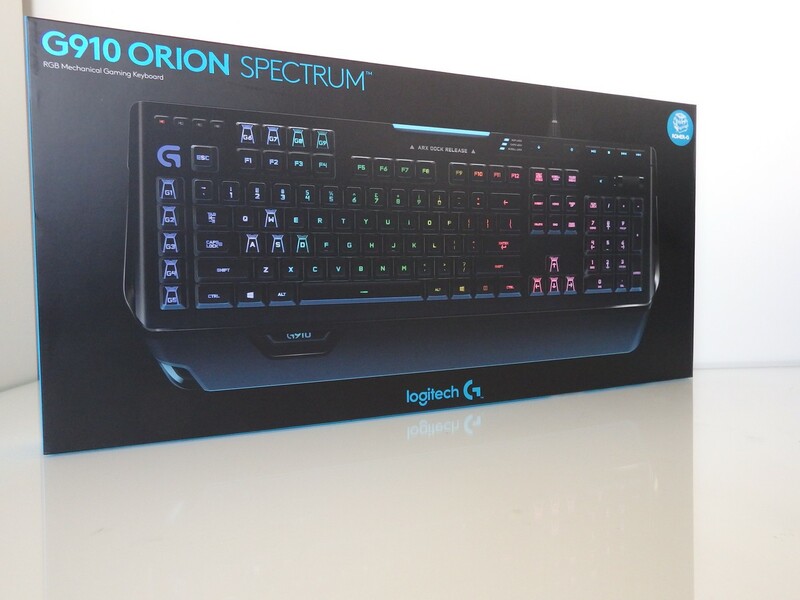 Well, probably not as easy as I think but obviously not too technically challenging because Team Logitech managed to pull it off with the new G910 Orion ‘Spectrum’. 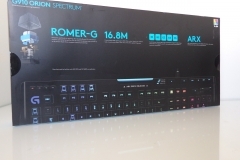 The trickiest thing in the whole change is the name – I don’t think it was clear enough but Orion Spectrum does line up with the G900 Chaos Spectrum and G933 Artemis Spectrum branded RGB Gaming Series products. So now that we have completed the history lesson, let’s take a look at why the G910 Orion Spectrum is still at the top of the pecking order. 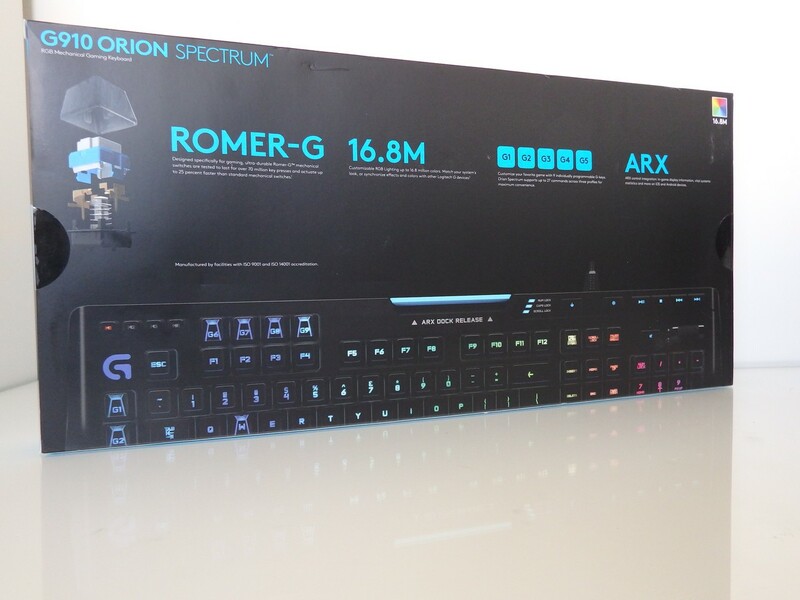 Also, don’t get the G910 Orion Spectrum confused with the G810 version that shares the same name as it has less features and a lower price tag. 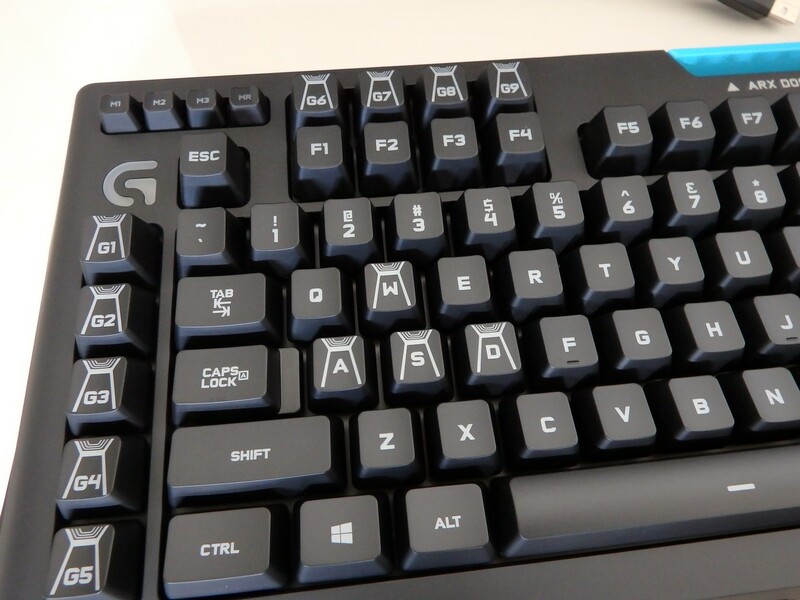 The Romer-G key is proprietary to Logitech. It’s their design and probably my favourite mechanical key switch available. The actuation point is 1.5mm, the switch is rated at over 70 million clicks and it doesn’t make as much noise as other mechanical switches on the market. It’s responsive, durable and relatively speaking, it is quiet – when you compare to other more widely used Cherry-type switches. 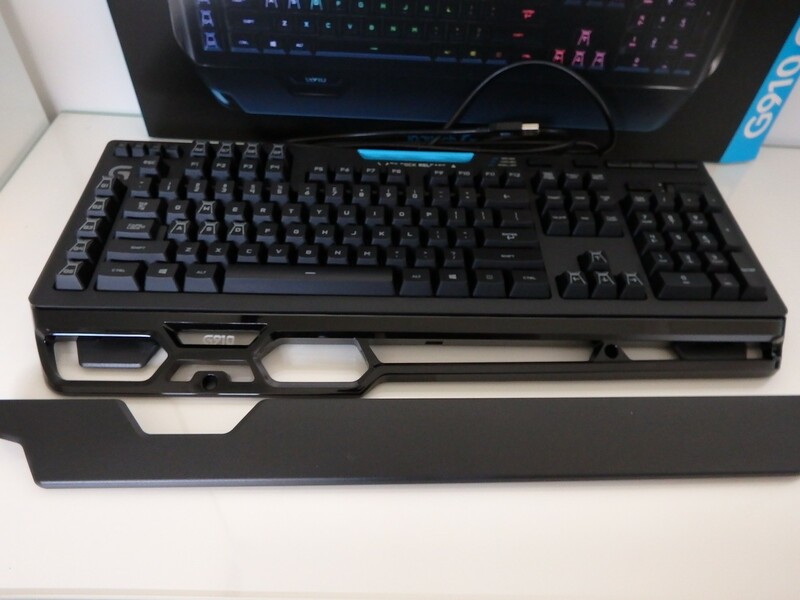 The more generic-shaped key caps make transitioning to the G910 Orion Spectrum easy and gamers should take literally a couple of hours to adjust. The cap etching is really precise and the RGB lighting shines through with great clarity. RGB backlighting is becoming more important as game developers use the APIs and include it in their games. Battlefield 1 has embraced it in such a way that it really does enhance the gaming experience. Keys flash when you need to interact – for example, the ‘F’ key flashes in blue when I’m near a door or window that I can open or the ‘R’ key flashes when I need to reload due to low ammo in my magazine. The keys that I don’t have mapped are not backlit to avoid confusion. When I’m dead, all keys go red – this extends to the G900 Chaos Spectrum mouse and G933 Artemis Spectrum headset. It’s brilliant. All of this LED magic is available by default without the need for me to do any manual mapping of configuration. I love it. Tom Clancy’s “The Division” by Ubisoft has a similar implementation as does GTA V where the keys change colour depending on your character and the function keys at the top flash red and blue when the police are after you. This adds immersion in a way that non-backlit or even single colour backlit keyboards don’t – it’s actually interactive. Initially this built-ion dock for a smart phone or tablet might have seemed ‘meh’ to many but game developers are also starting to embrace the concept of companion apps for their games. Even if the developers haven’t seen the light yet, many other app developers have. Sure the core functions provided by the ARX Control app are handy like system monitoring, media controls (that are already on the keyboard itself), profile selection, mouse sensitivity control and companion plug-ins like The Division Applet. The companion app that I use the most is the PIPBOY app for Fallout 4 that turns your phone/iPad into a PIPBOY and integrates with the game so that you don’t have to bring it up all the time – it’s a game changer for me and if you haven’t found it yet, go to the AppStore now and get it for free. The ARX Dock is also handy for just seeing texts, emails or messages as they come in or perhaps tracking the whereabouts of that GPS enabled take-away that you ordered. It is detachable but you wouldn’t take it off. The new palm rest is very comfortable and doesn’t add much bulk or footprint to the G910. I like the new shape more than the original design on the “Spark” and am glad that the designers were able to bring this in for an interim update so quickly. The media controls are the same as the original, well placed, backlit in blue, not RGB and unlikely to be hit by mistake. There is also a ‘lights out’ button and game-key that disables the windows buttons. The hero of the media set is the volume barrel – I still prefer this to knobs/dials or volume +/- buttons found on some competing products. I don’t use these as much as perhaps I should but there are 9 ‘G’ keys that can be coloured and assigned macros. There are 3 ‘M’ buttons on the top left of the keyboard that can adjust the functions further meaning that you have the potential for 27 macro functions assigned to these keys. They also have a slightly different outline on them so that you can differentiate the macro buttons from standard or ‘Function’ keys whilst using your peripheral vision. What’s not to love? Logitech took what I still consider to be an almost perfect product and made it a more universally appealing. The changes are so subtle that “Spark” owners shouldn’t feel jilted and new buyers can’t really go wrong between the two G910 versions. 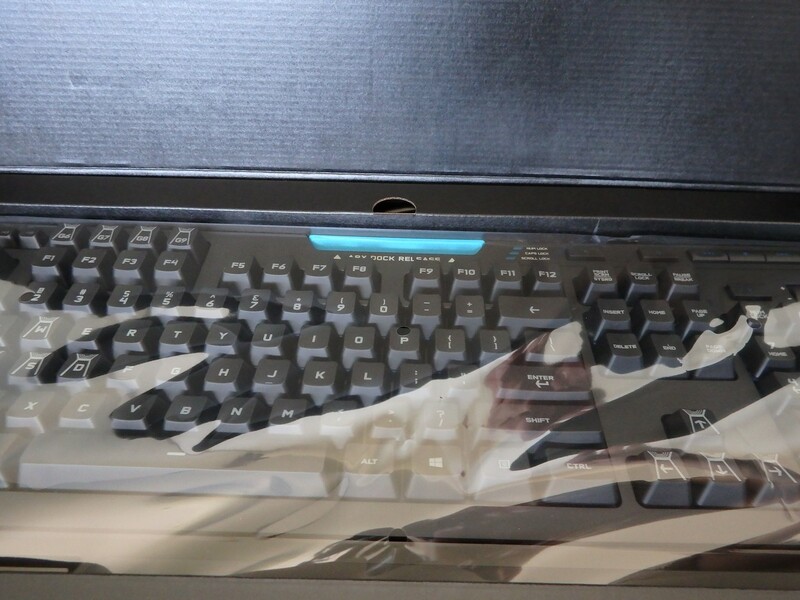 If buying one of these for a gift, I’d probably recommend the G910 Orion Spectrum as it is safer design. 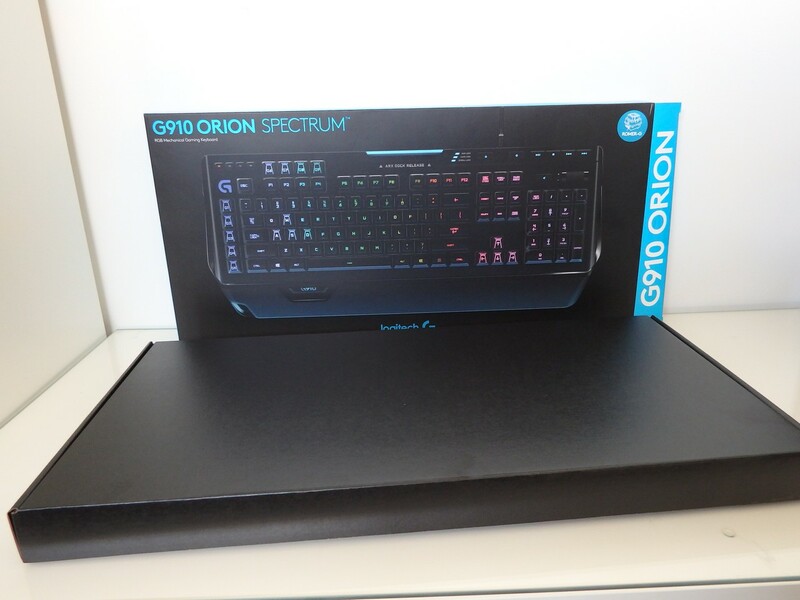 The G910 Orion Spectrum is top shelf pricing and a top shelf product at a street price of ~$180. 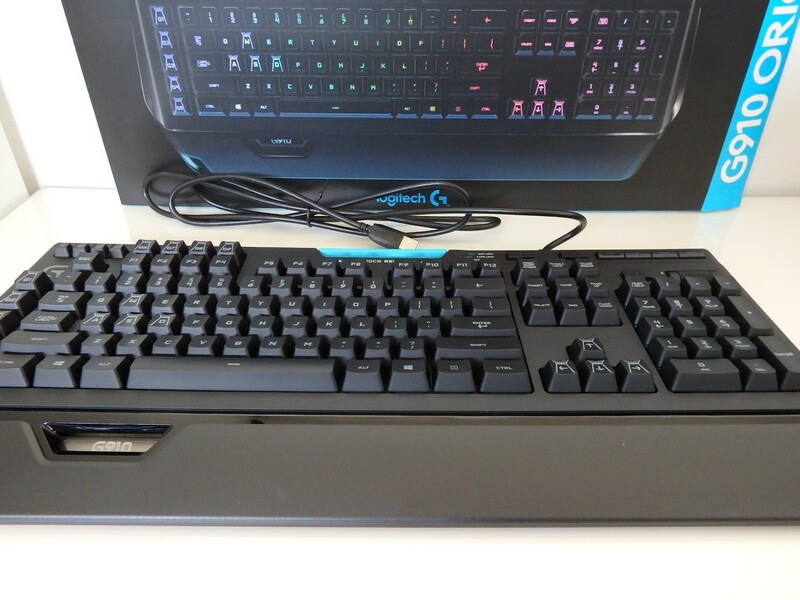 Keyboard and mouse are critical devices for any PC gamer so if you can afford to visit the premium peripheral space, a G910 Orion Spectrum is a purchase that you’re still going to feel good about the morning after.